You'll figure out the major themes of your life, mine your memory for dramatic incidents, stitch your assignments (and diary entries, blog posts, and other writings) together into a compelling plot, and polish your prose into believable dialogue and exciting action. The book also includes quick "clear communication" lessons about spelling and grammar, plus information and advice about different publishing paths. Simply follow the daily directions and in just one month you will have a memoir ready to submit for publishing. 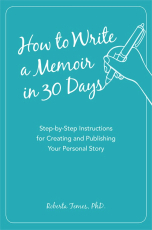 Whether you're a seasoned writer or a novice, dream of hitting the bestseller lists or just want to pass a little wisdom on to your grandkids, How to Write a Memoir in 30 Days is a fun, easy guide to writing the Next Great Memoir -- yours.